A documentary that concerns itself with the outskirts of life has the obligation to make more concrete connections to its privileged audience. The Willets Point area is a haven for Mets fans, its rich spectrum reduced to a superficial stop on the 7 train or a distant speck from an ignored window just before the touchdown at LaGuardia. But for those who toil in the salvaging yards, and who continue to fight for the right to maintain a livelihood, the Iron Triangle is a vital community where a sexagenarian native lives with a blunt enthusiast who is overly familiar with the hoosegow. The native takes the time to observe the sparrows that return every May, defying the waste, the uncharted museums of car parts, and the steadfast flooding that comes with the rain’s brutal pounding into the pocks. The blunt enthusiast lacks money, but cannot offer a reliable explanation as to where his drugs from. Meanwhile, seemingly wiser and truly unsympathetic city forces rush to “redevelop” and “renew,” without bothering to communicate their half-made plans to those trying to subsist at the other end of the bulldozers. Such is the perfectly sensible worldview promulgated by Foreign Parts, a mostly engaging picture that invites comparisons to Ramin Bahrani’s Chop Shop. This documentary was shot by a pair of Harvard anthropologists named Verena Paravel and JP Sniadecki, and it deserves both a distributor (for how else will the film’s subjects find an audience?) and a few criticisms. For while Foreign Parts does a fair job at portraying life without commentary, it doesn’t give an outside observer the full picture of Bloomberg’s avaricious intent until the very end – a rather strange choice, considering its obvious though admittedly mild subjective position. The first twenty minutes are something of a visual essay, with subway trains and planes reflected in mucky puddles, cars gutted and thrown onto their sides like corpses, and ripped off rear view mirrors dangling as surrogate vanities. But when the people photographed start to speak at roughly the twenty minute mark, the two anthropologists-turned-filmmakers — despite their efforts to capture bistec barbeques (with the striking juxtaposition of a spare steak accidentally thrown atop a wrench), gritty locals dancing without apology in diners and around gutted engines, and a good deal of hustling – reveal their conspicuously Anglo-Saxon approach. Which is to say that Paravel and Sniadecki prefer to talk to people who speak English – “the only white girl in the junkyard” and so forth – instead of those who speak Spanish. While these subjects are certainly interesting (one late middle-aged man shouting in the streets, directing approaching cars to those who have the parts, could almost be confused with Bruce Willis), this seems a glaring and elitist omission for a community in which 80% of the people don’t speak a word of English. This divide is perhaps best epitomized by one lengthy take of a Hispanic parts-gutter rattling off the names of automobile brands. I kept wishing that the filmmakers possessed the humility to learn some Spanish, hire an interpreter, or figure out a more effective way to flesh out this man’s story. Surely he is more than the sum of his parts. But the filmmakers are somewhat recused by their good intentions. It’s very clear that the final result comes from a place of passion. Yes, the duo isn’t particularly street smart. They are easily fooled by the performances of two men engaged in some male swagger over drug habits. (A discussion relating to this “performance” point was brought up during the press conference, which you can listen to below in audio form. It starts around the 19:18 mark, with Paravel talking about the difficulties of “penetrating the space” and “giving equal parts to the human being.”) But they do talk to those who shiver in vans during the winter. And they are good enough to not invade the space of a smiling and diminutive woman with a slur, who is a quiet but friendly presence among the neighborhood and who proudly declares why these are “her people,” but who doesn’t entirely impart her life history. And there is one very pleasant shot where the camera almost dances with this woman. It’s a nice invitational nod to the audience to pay attention. Yet a documentary that concerns itself with the outskirts of life has the obligation to make more concrete connections to its privileged audience. The film snobs who tend to flock to movies like this often fail to understand that twelve George Washingtons represents a good deal of green. 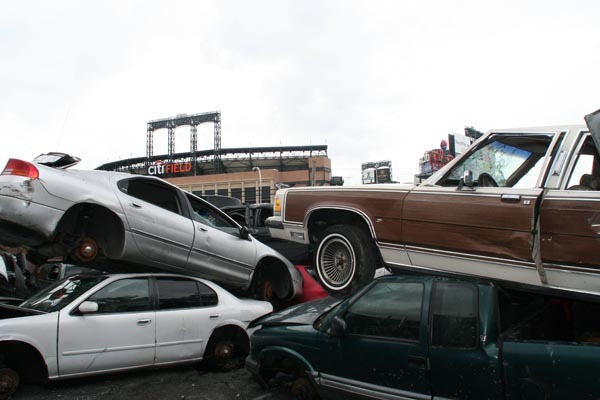 And I greatly wished that Foreign Parts had been strong enough to force some of these contemptuous assholes to understand that the Willets Point scenario sees callous greed paving over the working poor, that lives are now being crushed, and that souls are being left behind in the Almighty Dollar’s cold shadow. In the end, the people who will see Foreign Parts will walk out of the theater and spend the next hour talking over wine and cheese and confirming how “enlightened” they are. And eventually they’ll forget about the people who live in Willets Point. I’d curse the filmmakers for keeping a vital story so tepid, but then people who have rarely known a day without a hot meal and who rarely speak outside of theoretical vernacular often don’t know any better.